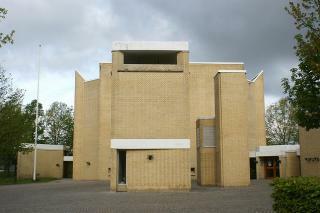 Farum is the location of Stavnsholt Church, which was designed by the architect Johan Otto von Spreckelsen and built in 1979-81. Besides the church building itself, the church complex includes a parish hall with offices, confirmation suites and a large meeting room. From outside, the complex has a complicated layout of closed cubic shapes made of yellow brickwork. But whereas the complex outwardly shuts itself off from its environs, the interior opens upwards. The closed sculptural effect of the exterior is contrasted by the interior of the complex where the quadratic church space is daylighted from above by light that streams between the external walls and the cast cassette ceiling. In this light-flooded space, the geometrical, cubic shapes are employed in a ratio that emphasises the church interior as a place for spiritual insight and immersion. The welcoming effect of the church also characterises the parish hall, where the various functions and interiors are exquisitely linked by a joint atrium courtyard. Stavnsholt Church demonstrates von Spreckelsen's skill in designing a functional and relevant church complex, but also exemplifies the architect's dedication to balancing geometry, format and daylighting. In 1983 the Danish architect Johan Otto von Spreckelsen won an international architectural competition in Paris to design a monumental building for the Parisian business district La Défense. The now world-famous Grand Arche de la Fraternité was completed six years later. Spreckelsen's building embodies clean, strict and refined lines. In the form of a gigantic open cube of marble and glass, it stands as a functional building and a monument all rolled into one. The building has a framing effect that achieves visual coherence with its surroundings. In that the office buildings are visible through the "window" of the arc, Spreckelsen's design has the effect of unifying the somewhat fragmented high-rise architecture of this part of the city. And, not least, Spreckelsen's Grande Arche links La Défense with heritage Paris by completing the historic axis that runs eastwards from the Louvre. Yet the arc does not give the impression of being a culimination or conclusion, since the axis continues, in principle, on the other side. Spreckelsen's architecture embodies nothing ultimative, but rather qualities of openness, involvement and dialogue. The architect himself commented that his building is intended as a modern ”Arc de Triomphe”, dedicated to the triumph of humanity as a symbol of a future in which everyone can meet freely.